Australia’s forests are full of Trees which are native treasures and what’s more it is like one big organic supermarket! Not only is there the spectacle of the tree’s size, coloured blossom and shapes of trunks, but also the thrill to find out that many blossoms are edible, with leaves that can flavour food or used in medicines. The wood of many trees was used in Aboriginal or modern day tool making and many of the colours for the Aboriginal paintings were extracted from trees. Australia is a high energy country and walking along the streets you feel the soul for the energy rich environment. The cities are aware of the aliveness of nature and the awe and wonder it brings especially when looking at these incredible trees. There is even a “Hug a tree” culture as they believe trees have vibrational properties and patterns different from our own. So Tree Huggers understand that when they hug a tree it absorbs the negative energies and they in turn are able to absorb the trees beneficial properties. The longer you stay in Australia the more curious you become about recognising native trees and knowing their names, so here are the Top 10. 1 Callistemon -Bottlebrush – A Powerful Medicine or can be used to stuff beasts! This attention grabber, is quite beautiful as it stands out with its brilliant red flower. The tree is irresistible to birds, especially honey eaters because of their sensational spring colour. 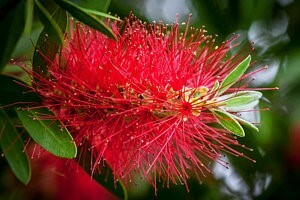 The Bottlebrush is so named because the flower looks like brushes for cleaning bottles. 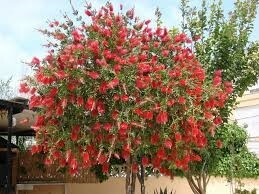 Scientific research on this tree has shown that the Bottlebrush has antibacterial, antifungal and antioxidant properties. Whilst many native species of the Bottlebrush are used for tea, the blossom can be used as a sweetener or marinade too, the result is both pleasurable and healthy. Their flowers have been used as a tan dye and their leaves used as a cinnamon dye. 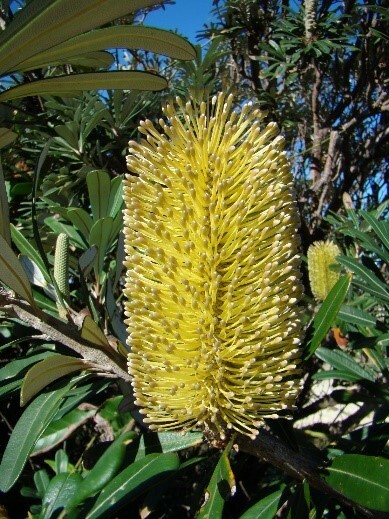 Aboriginals used the Bottlebrush to improve the taste of day to day food, by stuffing beasts as they were roasted or used, like a bay leaf, to flavour vegetables. The hard wood is close-grained, heavy and tough and is used for tool handles and fuel. Be advised some websites say the entire tree is poisonous though they have been used to make tea for virtually thousands of years. It has much potential in medicine, especially in wound healing, but much more investigation is needed in this area. In appreciation of one of Australia’s favourite native plants, the Golden Wattle (Acacia pycnantha) forms part of the Australia floral emblem and is incorporated into the design of the Australian Coat of Arms. There are more than 700 different wattle species and are the most abundant, and widely spread out of all Australian native plants. They occur from coastal zones and mountains to dry inland. Although some can be dangerous or poisonous, several are edible. The Queensland Silver Wattle has blossoms that can be mixed in a light batter and fried into small fritters, or they can be served with sugar and whipped cream. Blackwood (Aciacia melanoxylon) is valued for its hardwood timber. 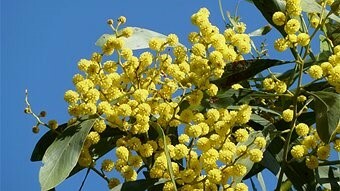 Whilst some Acacia are valuable for perfume essentials oils and tannins. 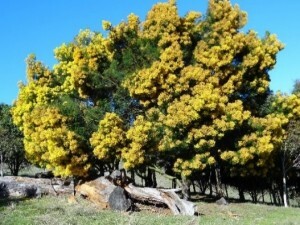 The Australian Acacias are commonly called Wattles and their pliable branches were once woven into the structure of early wattle houses and fences. In the Australian Spring most of the golden Wattle comes into flower, with each flower head as a bunch of many small flowers making it large, fluffy, yellow and sweet smelling flower heads. 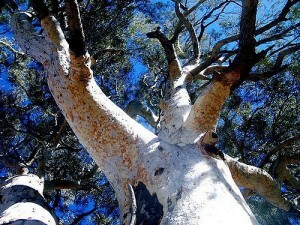 Giant Eucalyptus trees (Gum trees) have the habit of dropping large, heavy branches without warning! They do this to preserve water or simply as a result of brittle wood. In suburban areas, as the number of roads, buildings, concrete slabs and paths increase this limits the availability to water. So this self-pruning is necessary hence in populated areas they can be a danger to humans, earning the nickname Widow Maker. Damage to cars and buildings is common during storms and strong winds. The Eucalyptus was originally planted as street trees to provide welcome shade to the extreme temperatures of Australia, also to serve as a shelter for many species of native Australian animals and birds. Many also play an important role in stabilising river banks. The Koala, is one of the few mammals to survive on a diet of Eucalyptus leaves, because the leaves are extremely poisonous as well as low in fibre and nutrition. 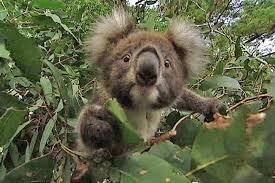 To cope with this diet, nature has equipped Koalas with specialist digestive adaptations. There are an enormous variety of Eucalyptus trees which are fast growing and can grow to over 40 metres in height. Since early settlement days, Eucalyptus trees have been a vital source of timber and firewood. They have played a key part of the hardwood timber industry and is used in making furniture. The Aborigines have used Eucalyptus for its disease-fighting properties. They used it as remedies for fever, wounds, coughs, asthma and joint pain. Oil extracted from the Eucalyptus leaf has a powerful antiseptic, deodorizing and antibacterial properties. The trees fragrance acts as a repellent to ticks and fleas, which benefits pets and their owners! 4 Moreton Bay Fig –A Strangler Vine or a Giant Tree? 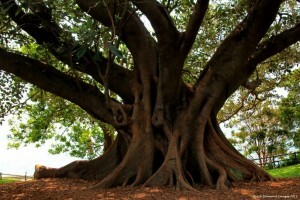 Do you give a Moreton Bay Fig about it? The Moreton Bay Fig is also sometimes known as the Dragon tree because of its root structure twisting and turning creating mystical shapes. Their large, curvaceous buttressing roots can develop into trunks, some are aerial roots and are long and dangling, creating a sense of awe and wonder. They are usually heavily branched in crowns, and consist of masses of foliage. The spreading tree with its powerful branches gives people the perfect spot to enjoy a picnic and a glass of bubbly. The fruit from the tree is not as palatable as the figs we are used to buying, but they are edible and contain valuable sources of calcium, magnesium, iron and potassium. 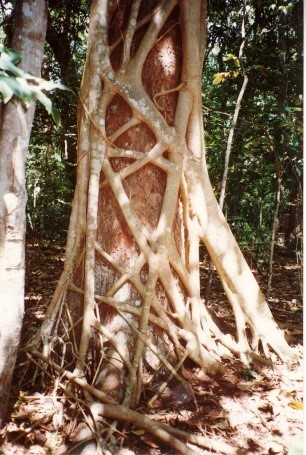 Indigenous people have used the roots or inner bark to make woven fishing nets, cord for bags as well as sturdy cloth. The enormous branches and bark have been used to make waterproof dug-out canoes. The sap which oozes out when the tree is cut was used to treat small wounds and treat infections, yet self contradictorily, it is an irritant if comes into direct contact with the skin. They not the best brush! Some species of Grevillea contain a sweet nectar in their flowers that humans can drink. 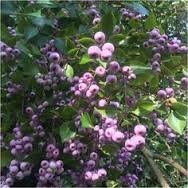 Aboriginals used the nectar by shaking onto the hand to enjoy or with a little water to make a sweet drink -“Bush Lollies”. Yet the nectar of some species (generally cultivated ones) contain toxic cyanides that can poison humans! 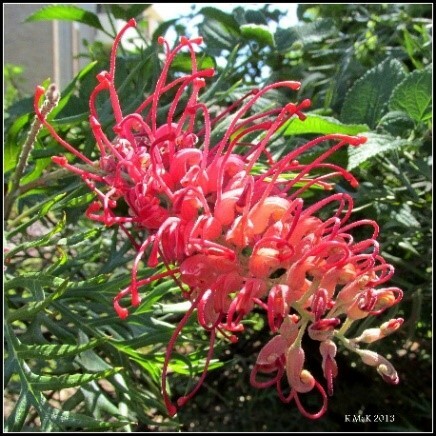 Grevillea is also known as the toothbrush plant, silly oak or spider flower. They can form a low shrub-50cm or grow to a large, tall tree to 35 meters. The flowers are cylindrical, long and bush like and can be red, orange or yellow in colour. Individual flowers are composed of colourful sepals divided into four lobes with elongated protruding styles. The brightly coloured, petal-less flower attract many birds and insects, especially honey eaters. Before the extraction of Aluminium, Grevillea timber, known as “Lacewood” was used for external window joinery as it was resistant to wood rot. Wood of the Grevillea can also be used for guitars, furniture and fences. Warning comes with these items that the wood can induce allergies in the form of dermatitis in susceptible individuals. 6 Lilly Pilly (Syzgium smithii) -“Neighbours-Be-Gone” Trees! Lilly Pillies have white, fluffy flowers that produce a pear shaped red berry which is reddish pink/purple fruit, known as Riberry or “Australian Cherries”. The fruit is edible having a tart cranberry-like flavour with a hint of cloves and has been a gourmet bushfood since the early 1980”s. The fruit can be used in jams, jellies sauces, syrups and confectionery. Their dark green leaves are smooth and glossy with a bronze/red new growth. But be warned there is a pest which feeds on Lilly Pilly and causes pimples on the leaves, a visual pimply problem indeed! Melaleuca, commonly known as Paperbarks, have thick bark that flakes from its trunk. This of course provides a fun activity for the curious who can peal a strip off and contemplate what it could be used for! 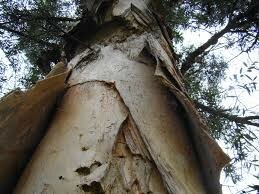 Paperbark can be used for bedding as it is very soft and can keep you dry. Aboriginals treated Paperbark like roof tiles, in order to make a place to shelter by placing over sticks pushed in the ground. Aboriginal women would use them as bowls to put their babies in. Softer pieces of bark were soaked in water and wrapped around food such as fish or kangaroo and placed on the fire to cook. The oil that is found in the leaves can be used as an antiseptic. Aboriginals crushed tea tree leaves and applied the paste to wounds, as well as brewing a tea for throat infections. The oil has now many uses including treating infections of the skin and household uses, such as shampoo, antiseptic creams, soaps and a household cleaners. Paperbarks are a small to medium sized tree which are often found growing alongside Eucalyptus around watercourses and swamps. Their trunk is covered by white, beige and grey, thick papery bark. The green/grey leaves are egg shaped with cream or white bottlebrush shaped flowers appearing in the late spring to autumn. Aboriginals would use the smouldering cones as torches for both light and warmth. In the past the reddish wood of the Banksia was used to manufacture boats and boat parts. Nowadays they are popular for the cut flower industry for making fresh or dried flower arrangements. 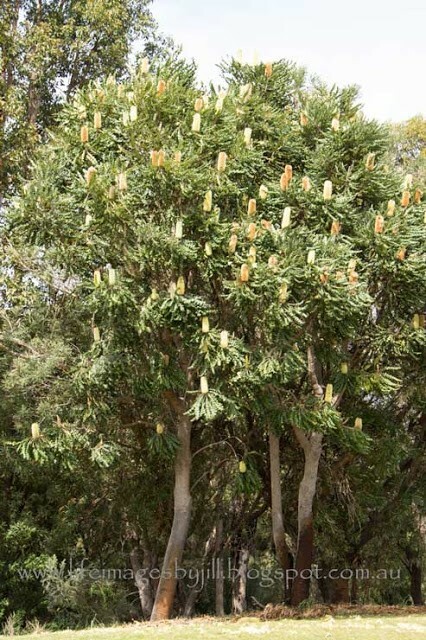 The ‘cones’ of the Banksia can be used for the manufacture of ornamental items or sliced horizontally and used as drink coasters. Banksia grow as shrubs to trees up to 30 metres tall, with a distinctively papery pale coloured bark and leathery leaves arranged spirally. Some develop leaves which have a coarsely toothed edge. Flowers appear towards the summer into the autumn and are bottlebrush like and white, cream, yellow to red in colour. 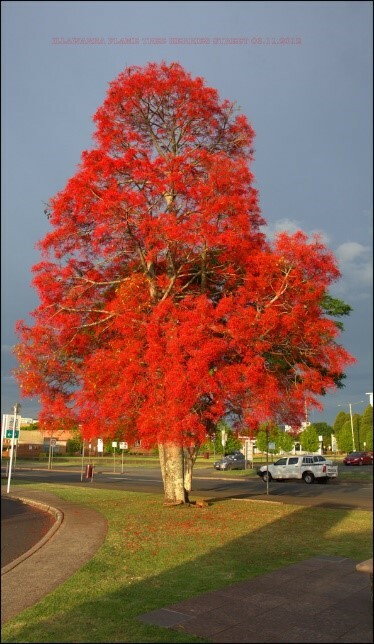 9 Illawarra Flame Tree- A Leafless Tree when Flowers Appear, but will not cause a fire! The Illawarra Flame Tree is a spectacular flowering tree which tends to flower on bare wood. 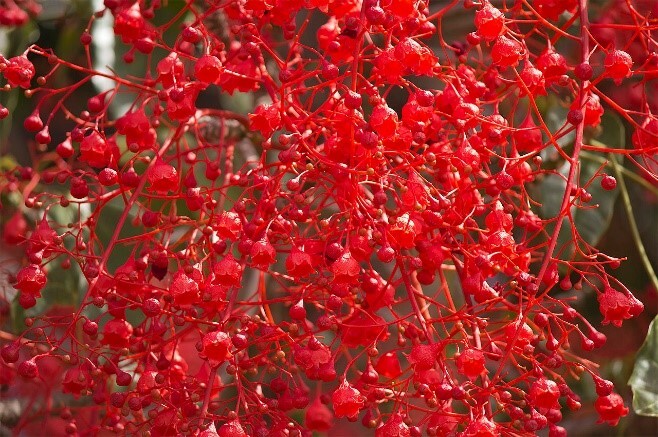 It’s striking brilliant red, bell shaped flowers that often cover the entire tree after it has shed its leaves, gives the effect of a tree on fire hence the name. Sometimes you will see the entire tree covered with these glorious flowers, other times just the odd branch but still the splendour of the colour is spectacular. A small to medium spreading tree, it can grow to 40 metres but generally reaches 20 metres tall. The inner bark of the Illawarra Flame Tree has been used to create fishing lines. The leaves are variable with up to 7 deep lobes. Flowers are bell shaped with 5 partially attached petals. The large pod-like fruits are dark brown and contain thin bristles, which are potentially hazardous as they contain hairs which can be inhaled, can stick into humans and cause irritation, and in the worse-case scenario, cause blindness. 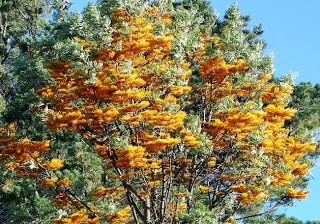 The yellow seeds of the Flame Tree are nutritious and if cooked on a fire to remove the hairs, they are then safe to eat. 10 Jacaranda –Signal’s to Students it is time to study! 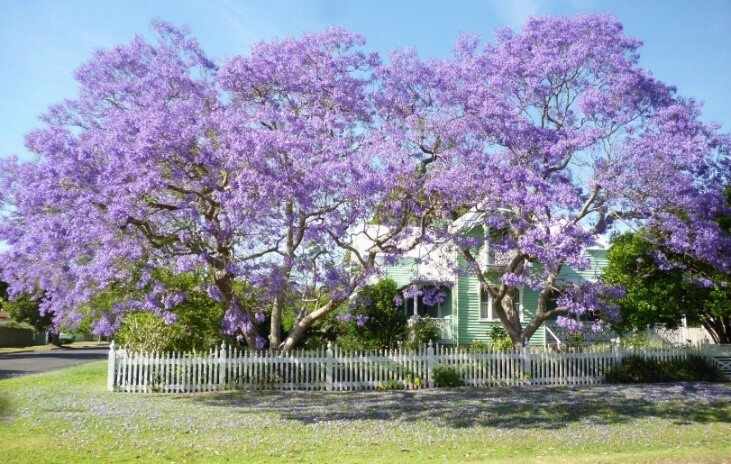 Jacaranda is one of the most beautiful trees in the world and in November, it is Australia’s Jacaranda season. Famously for many years students have lived by the folklore, that any student who fails to study before the trees first bloom appears, will fail their exams! -as their exams have usually started in November so they would have not given sufficient time to their studies. Jacaranda trees transform the area as they line the streets and are commonly used in landscaping. They enlighten the world by beaming a purplish blue haze from their canopy of trumpet-shaped flowers radiating colour through their feathery leaves. For a few magical weeks, the light seems to change bluer, so when walking under the shadow of the tree is like being in an impressionists painting. As the flowers start to drop it is even more beautiful as walking on this carpet of purple, with some flowers still above, makes you feel like you are in a dream. Yet there is a more serious issue as the petals start dropping as they are slippery when wet. Even a car can be written off after rounding a corner on the treacherous wet flowers. It has even been known, for a pond full of fish to be smothered by a day’s petal fall. 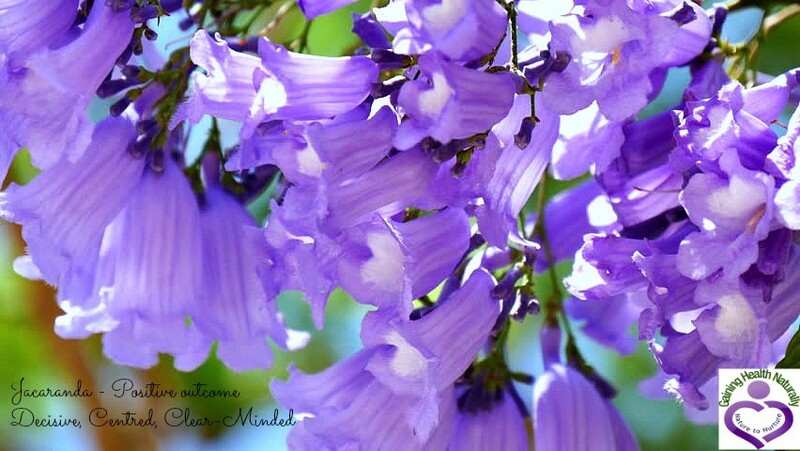 Jacarandas have leaves that make a purple dye and the timber of some species is used in woodwork.